Smiley Faces (often referred to as a smiley or a happy face) are a visual representation of a smiling person widely used on the Internet to reflect one’s emotion using only two characters. Since its introduction in 1963, the yellow happy face has become a pop culture icon. In 1982, smileys have entered the Internet with Scott Fahlman using it to convey jokes and emotions with his peers. The most common representations are : ) and :- ) Interestingly, the smiley has first appeared in Robert Herrick’s poem To Fortune in 1648, where he included a sentence ‘Upon my ruines (smiling yet :). 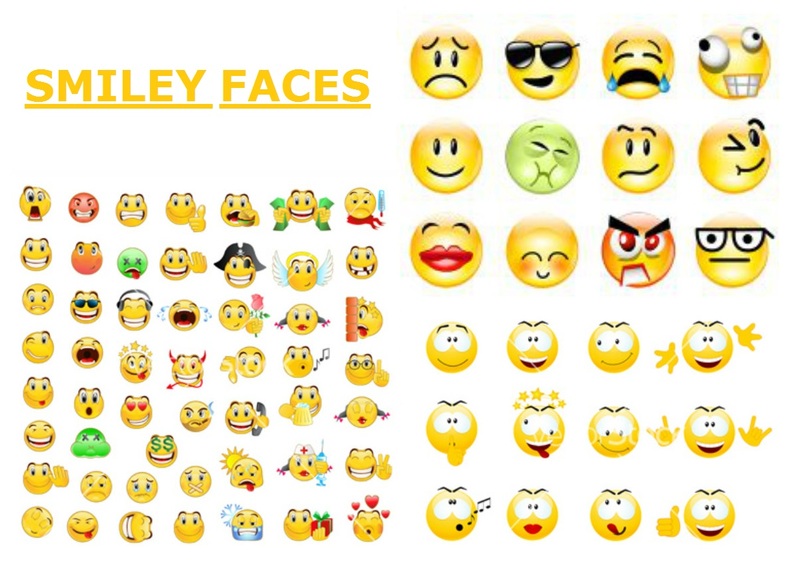 Since their introduction the smileys have expanded to convey other emotions, hence the other name, emoticon. Now smileys represent not only happiness but also sadness and a whole array of other emotions. Some of these are captured in the image below. With introduction of social media, the use of smiley faces have exploded with many platforms and apps offering a variety of emoticon options. There are also Unicode smileys going back to Windows 95 that can be accessed with various hotkeys on a Windows platform. Many smartphones including iPhone have adopted the use of happy faces in their text apps.